MISSOULA – Members of the organizations Blue Skies Campaign and 350-Missoula participated in an act of nonviolent civil disobedience next to Montana Rail Link (MRL) tracks on Sunday, to prevent the passage of a coal train through Missoula. 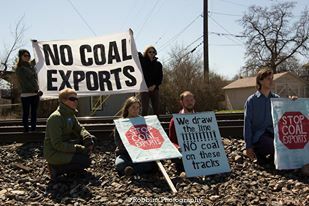 Seven people held a peaceful sit-in on MRL property and stretched a banner across the tracks, while about twenty people gathered nearby holding signs that read “Stop Coal Exports.” A coal train on its way to the West Coast was held up on its way out of Hellgate Canyon by the protest. ← Take Action for the Climate on April 26th!